You’ve no doubt heard of the pastime of orienteering, in which you dress up in your finest hiking regalia, navigate miles of hairpin-turn mountain roads to an appointed trailhead, hit the trail with maps designed to get you lost, and dash through the bush to get it over with ASAP. Not that I’m complaining. If my wrong turn hadn’t taken me half way to Albuquerque, I’d have been sitting there on the picnic table at Joseph D. Grant County Park with nothing to do after about 57 minutes, violating my “hike must last longer than drive to get there” rule. My only gripe is that to my mind, the next best thing to the towering exultation of victory is the perverse pleasure of coming in dead last (to my enduring chagrin, my hometown always came in 297th in those “top 300 places to live in the United States”; I always wanted to be from the worst town in America). Bad as I was, somebody robbed me of the honor of being worst. Alas. 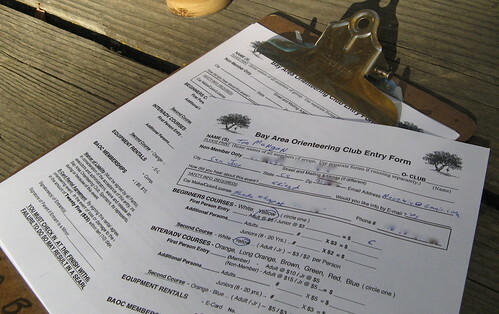 So this is what happened: Sunday capped the Bay Area Orienteering Club’s three-day O in the Oaks competition, which pitted some of the best orienteers in the West against the relentless hillsides of Grant Ranch. 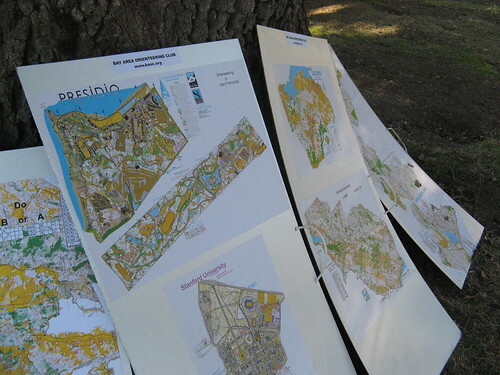 All rookie whining aside, finishing an orienteering competition courses is a major achievement — the organizers give you a map with contour lines and a few landmarks, and you have to head out into those hills with a full head of steam and hope to finish without inducing a myocardial infarction. The top competitors are runners, not hikers, with a superior knack for scanning maps, reading terrain and avoiding wrong turns. 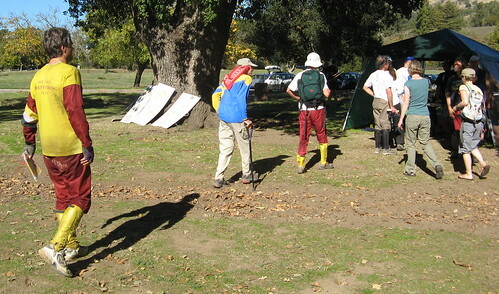 BAOC is friendly, helpful outfit that also offers “recreational” orienteering courses better suited to people who have come to rely on these things called trails to keep them from perishing in the wilderness. Steve Sergeant of Wildebeat fame invited me to come along this weekend’s outing … I thought about inviting some Two-Heel Drive regulars along, but I wanted to see what it was like first — and figured it’d be better for my credibility if my most avid readers didn’t have to organize the search-and-rescue operation to get me back to civilization. So this is what it’s like: busloads of guys and gals with 3 percent body fat are ferried up the road to the overland equivalent of a double-black-diamond moguls route (some require a mile of hiking just to get started), while beginners and Boy Scouts take the bunny-slope versions near the event HQ. 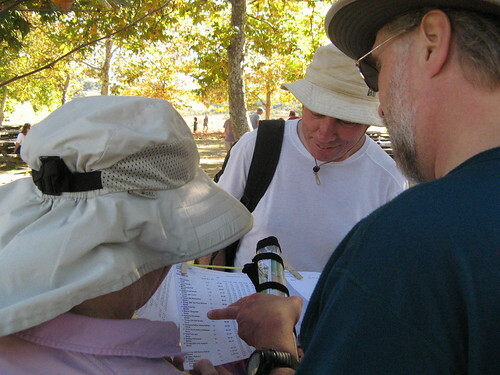 Advance registration is mandatory for the hard-core routes, but mere mortals (and the directionally challenged) can show up on the day of the event and sign up for a recreational course. Sunday’s outing cost $6 to enter and $3 to rent an electronic memory-chip doodad that records the route. Beginners can take a quick how-to course and choose from the easiest course — which is all on trails — and the next-easiest, which requires a bit of bushwhacking. 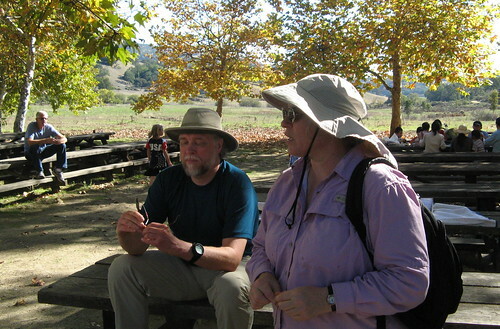 First timers who’ve done lots of hiking should do fine on the next-easiest. BAOC leads events all over the region. Here’s a sampling of event maps. Competitors’ times are listed on these printouts. After you register, you head over here to get your name and entry number into the computer system. Here’s my map. A compass is not mandatory, and going without one can get you on your way to that coveted last-place finish. This route is less than two miles, so the checkpoints are actually much closer together than you might imagine if you used the maps provided by the parks department. Most of my stops were no more than five minutes apart — but my wrong turn was like 50 minutes between stops. Object lesson: if you see no checkpoints within about 10 minutes, you’re almost certainly going the wrong way. I followed my usual bull-headed determination to get to a point where I knew exactly where I was and got back on course from there. Slow, but not slow enough. I’ll know better next time. A sample checkpoint. You stick your memory-chip doo-dad into this thing; it beeps and records your time and location. You must do all the checkpoints in order to avoid disqualification. The rookie-orientation course will fill you in on how it all works. If this were on a college campus there’d be a requirement to toss back a shot of tequila at each stop, and the most ardent collegiate orienteers would play to lose (not that I’m recommending this, mind you). I suspect these guys were from a Boy Scout troop — trotting to juice their finish times. Here’s the finish line. They were about two minutes from sending out a search party for me. Steve and Jean, the WildeBeat team. 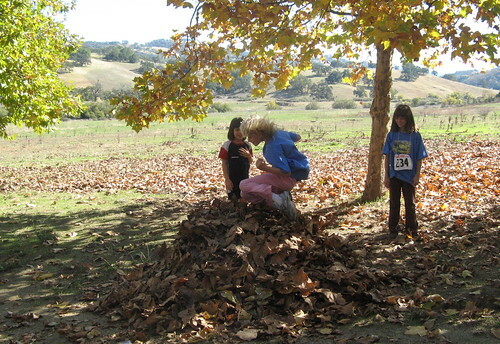 A time-honored autumn tradition: kids leaping into piles of fallen leaves. 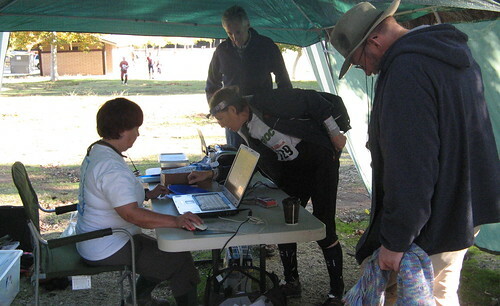 Hardy orienteers return from one of the “orange” competition courses to record their times. The guy in the blue jacket was walking with a cane. People of all ages ran the courses. 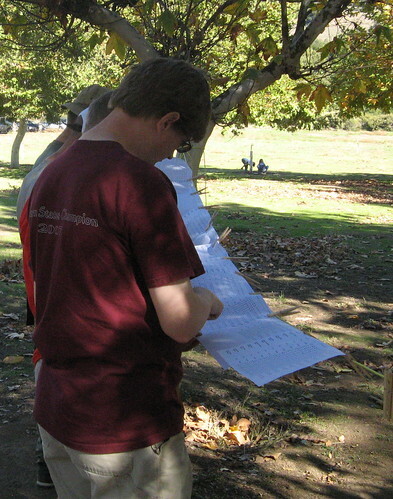 Giving our scores one last check. Steve was in ninth place at this point. Jean came in just ahead of me — she had a much better excuse for her time: a bobcat sighting that required a 10-minute break to admire its antics. It could make you a better hiker. It obliges you to learn how to decipher contour lines, map legends and other cartographic oddities. Trail runners should give it a try. Plain ol’ hikers have no chance against the top competitors, but I’d imagine any veteran trail runner could be very competitive. If you don’t get lost, you need a bigger challenge. Once I figured out my wrong turn and got back on course, the rest was laughably easy, and over way too soon. If you’re not competitive by nature, stick to hiking. 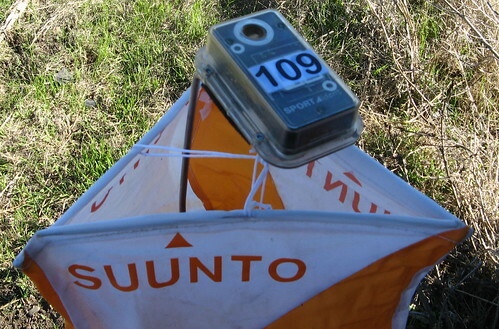 Orienteering is a race, the point of which is to either a) win outright; b) finish higher than you did last time; or c) best somebody you find really annoying. Not playing to win is sort of like going to the horse races and not betting. That looks like a lot of fun! I wonder how this old infantryman would fare, if I dusted-off the compass and protractor? Of course, running would be completely out of the question – yikes! 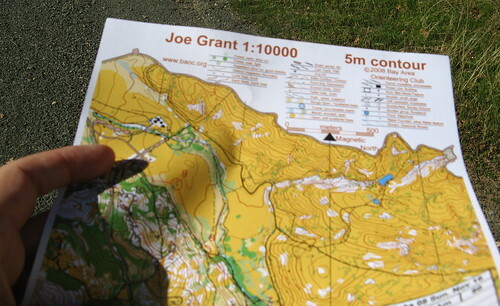 Roy: the compass is optional … the most competitive orienteers have a thumb compass they hold up next to their maps as they go but I don’t think they carry sharp objects like a protractor. Of course you wouldn’t be able to call in an airstrike, which would take some of the fun out of it. It’s fairly simple on the less-challenging recreational courses, which track trails, but the overland courses go right up and down gullies and canyons, so they’d be a bit more of a challenge. I slipped down one more rank because of the group efforts of another boy scout troop. Our mutual friend Anne took third place in the women’s competitive orange class. Congratulations to her. Your observation about Boy Scouts is probably correct. Those gentlemen were wearing the BSA issue pants with zip-off legs (except for the guy in the black shorts on the left). 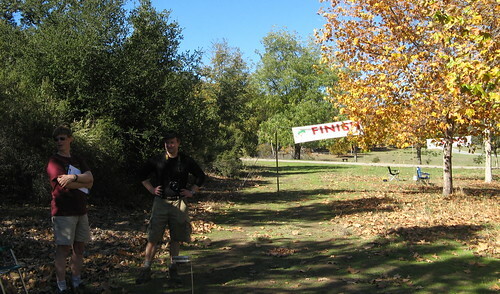 I keep pitching an orienteering event like this to my troops (boy and girl scouts), but they never bite. Oh, well. Roy, you are so right: It is a lot of fun. Old infantrymen and all others are welcome to come and try it out. A guy who already knows how to read a map and use a compass has a definite advantage. Lots of us walk the courses rather than running them, and there is a very wide age range. Besides the fun of very careful map-reading, here’s another reason for hikers to try orienteering: children who claim not to like hiking will often LOVE the treasure-hunt aspect of this sport. Even 5-year-olds can run up to the control flag and check to see if the three-digit number is the one you’re looking for. 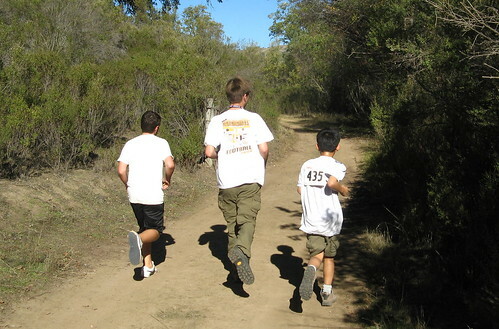 Some kids DO learn to run the courses as individuals, and do them very competitively. In fact, there is a small female national champion visible in the leaf-pile photo above. But a hiking family can sign up as a team, and the adults can enjoy a walk while the kids run to punch the controls. Fun article. I do hope you enjoyed your day out. A couple quick comments. > If you’re not competitive by nature, stick to hiking. Hopefully our maps will get you found more often than lost! At least that’s what they’re designed to do. 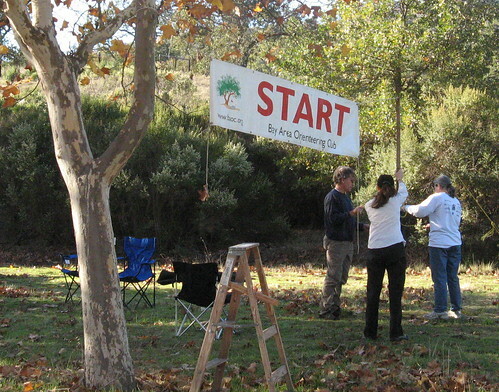 And to boyandgirlscouts, try pitching the idea of coming to the annual Scout Orienteering Championships, generally held each year in Sept/October. Imagine hundreds of boy/girl scouts trying to find their way around at the same time: it’s quite exciting. PS. Thanks for noticing my 3% body fat. I think you missed a decimal place, but flattery will get you everywhere.